The Brick hotel at Newtown has something of a history, and was built at an early day. The date is not known, but there was a public house there before 1744. It stands on land that Shadrick [Shadrack*] Walley located before 1684, and which Joseph Walley leased to Amos Strickland in 1748, for 20 years, but in 1761 the Red Lion, as it was called, was sold by the sheriff, and Strickland bought it. 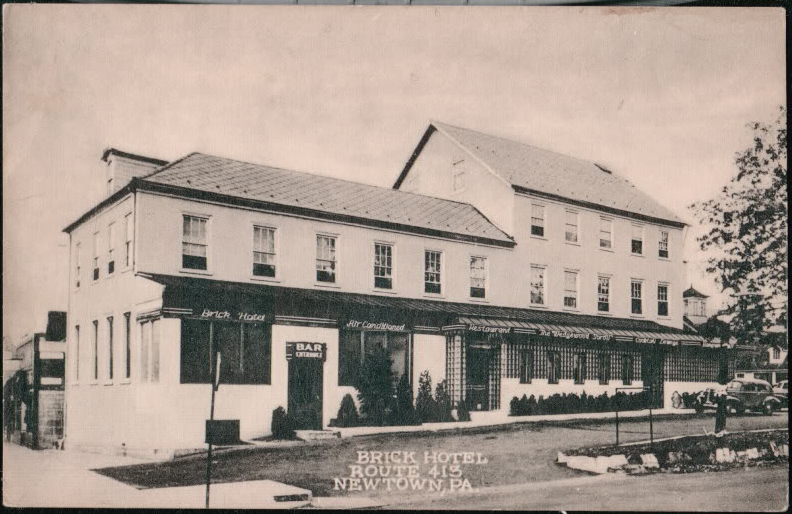 Amos Strickland, a farmer in Newtown township for several years, built a two-story brick house in 1763/1764 that is now known as the Brick Hotel as a residence. The land of Amos Strickland lay out along Washington avenue, then called Strickland’s lane, a well-known race course when the courts and elections were held at Newtown. The great-grandfather of William K. Carver, Newtown, did part of the carpenter work. From the surplus bricks was built the house owned by Mrs. Martha T. Heyde, once kept as the “Court inn.” The bricks were probably burnt in a field of Samuel Phillips. The ornate paneling used in its decoration was said to have rivaled the finest houses in Philadelphia. The house was converted to a tavern in 1780. In the early 19th century, The Brick Hotel was a fashionable resort for wealthy Philadelphians who boated to Bristol and then took a coach to Newtown. Not only did Strickland host George Washington and his officers, but he also may have hosted captive Hessian officers in December 1776. Strickland died in 1779 and his sons sold the house at auction to pay off their father’s debts. The Brick Hotel was sold to John Smock in 1792, and thence it passed through many hands into the possession of its present owner. This house is indebted to Joseph Archambault, who bought it in 1829, for most of its modern improvements. Joseph Archambault, many years owner and keeper of the Brick hotel, an ex-officer of the great Napoleon, came to Newtown about 1821 and succeeded the then keeper, Charles Hinkle, in 1825. He added a third story to the main building, and afterward built the two-story brick at the west end, besides making other additions. He kept it as a first-class hotel for several years, and years ago it was a resort for people from Philadelphia, and was generally filled with summer boarders. In 1837, Joseph Archambault made renovations to the Brick Hotel. It was described as a total of 102 feet long, with the three-story section being 42 feet high. There was cellar and two kitchens in the basement. There was a Piazza extending the front and west end of the building. The first floor had a Bar room, spacious Dining room, and three Parlors. Attached to the main hotel, facing Front Street (now State Street) was a two-story frame wing occupied by the Post Offices and additional chambers above. Attached to the east end of the hotel fronting on the Yardleyville Road (now Washington Avenue) was another kitchen with lodging room. Across the rear of the building as a gallery of piazza “affording a delightful retreat in summer”. The hotel was described as a frame barn with extensive stabling and sheds as well as an icehouse and other buildings suitable for such an establishment. 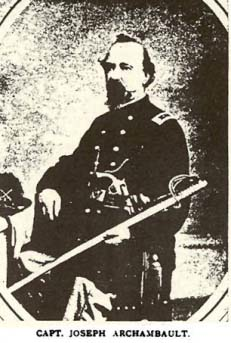 Captain Archambault retired from the hotel to a farm near Doylestown, and then to Philadelphia. 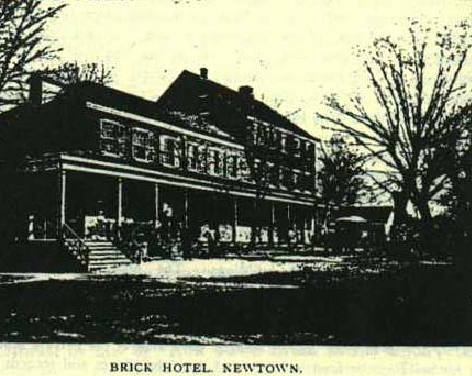 On April 30, 1868 Newtown businessman Hugh Atkinson was planning to improve the Brick Hotel by putting up a new porch around the building, tearing down the old addition and rebuilding it. Additional notes on the progress on the improvements were reported in June. The work was down to the wall papering and painting. The graining of the woodwork was being done by Issac Hellings. In the late 20th century, The Brick Hotel underwent extensive renovations to bring it to its present glory. All the Brick Hotel guest rooms were renovated to their present charm. As was the Beautiful Dining rooms and Bar area on the ground floor. The enclosed Veranda Dining area overlooking the garden and Newtown’s historic streets and quaint shops was added too. 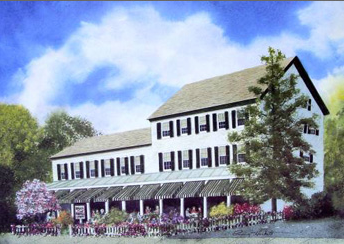 The Brick Hotel continues to serve as a center of hospitality much as it has during its near 250-year (250th anniversary will be in 2013/2014) history as an Inn.